I completed my second mosaic, “Be Not Afraid”, mid-2017, which I considered a large ambitious project at the time. It was roughly 3’ wide by 2’ tall, and took me about 6-weeks. I felt it was a success, so was itching to take it up to the next level, whatever that meant. Keep in mind that I have no training whatsoever in building mosaics. I’ve been fumbling around using online resources, including my favorite website for supplies, appropriately named Mosaic Art Supply. I had admired the reproduction of the San Damiano Cross hanging up at St. Michael the Archangel Catholic Church, my home parish. With all the intricate detail, but nothing overly subtle and realistic to tax my newly acquired skills, it seemed like a great next project. I figured the cartoony figures surrounding Jesus would be easier for me to pull off. There was a lot of detail to try to pull together with a low resolution tile pattern, but I hoped the eye would fill it the gaps, as it tends to do when there’s missing information. The first step was to research the subject matter. Feel free to imagine me with stacks of ancient tomes on the subject, but in all honesty, Wikipedia has been my best friend. St. Francis of Assisi by Giovanni Benedetto Castiglione. The San Damiano Cross was one of a number of crosses painted with similar figures during the 12th century in Umbria, Italy, It’s purpose was to teach about the event of Jesus’ death and resurrection. It was painted by an unknown artist in the the Byzantine style, which was common in Italy at the time. When the Poor Clares moved from San Damiano to the Basilica of Santa Chiara in 1257, they took the original cross with them. These days, it hangs in the Basilica over the altar of the Chapel of the Crucifix. The crucifix hanging over the altar of the original (although rebuilt) church of San Damiano is a reproduction. My final mosaic reproduction of the San Damiano Cross. Original San Damiano Cross painted around 1100 AD. Here is the image of the resurrected Jesus rising from the tomb. Over him is the hand of God giving a sign of blessing. Ten angels are crowded around welcoming Jesus to heaven. 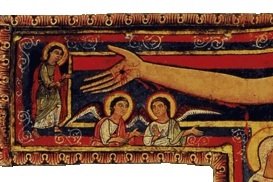 At both hands of Jesus are Six angels are represented as marveling over the event of the crucifixion. To Jesus’ right are his mother, Holy Mary, and St. John the Apostle, who were at the feet of Jesus when he died on the cross. This little guy to Jesus’ lower right is St. Longinus, who thrust his spear into Jesus’ side to prove he was dead. This other little fella is Stephaton, the traditional name for the soldier who offered Jesus the sponge soaked in vinegar wine. Obscured beyond repair at the foot of Jesus are St. Damian, St. Michael, St. Rufino, St. John the Baptist, St. Peter and St. Paul. The next step is to figure out how to render this image in the low resolution format of mosaic tile. With a fine paint brush, a skilled artist can apply just about any required detail to get ideas across. In mosaic, you are limited by an 8mm size (or larger) of the glass tile. Sure, you can trim it down, but there are definite limits of what can be brought out. That’s the fun, but a real challenge when trying to do justice to such a classic and magnificent work of art! At the end of the day, this isn’t a reproduction, but a very different piece that honors the original. Mosaic should do what it does well, and not try to emulate oil painting (or tempura, whatever the medium of the original). Obviously, every tiny detail couldn’t be duplicated with tile. Longinus and Stephaton to the lower right and left of Jesus were about as small as I thought I could pull off. I doubted there would be anything that could be recognized as a face (although I surprised myself there), but the other details like the body would help make them look like something recognizable. The servant (and his family) over Jesus’ left shoulder would probably look like a Caucasian flesh-toned blob. After a lot of deliberation as I worked through this piece, I decided to edit out the servant and his family. The crowd at the foot of Jesus was another challenge. There was almost nothing to work from! I struggled a long time researching and trying to figure out how to handle this. While I wanted to do my best to honor the original, if I was forced to make up stuff, I had trouble getting excited about adding more figures. I was eventually inspired to go another direction. It’s well established Jesus was crucified at Golgotha, which means the “place of the skull”. “Who’s skull” you might ask. Well tradition has it that it is Adam’s skull — yes, that Adam. If you look at any painting of the crucifixion before the 18th century, you will often find a little skull under the crucifix. Adam died because of the original sin, and Jesus, the new Adam, rose so we no longer have to die. Why the roses? Ah, I wish I could give you a tight theological reason for the roses! Sorry, it just felt right. As an artist, I have that prerogative. Roses are sometimes used to symbolize Christ’s holy blood, and there are some writings on the “Rose of Sharon”, but I’m not on solid ground there. 3 roses wasn’t arbitrary though, because 3 is a constantly repeating and meaningful number in the bible, most importantly the Holy Trinity. The color scheme was another challenge. Generally speaking, the pallet of mosaic tile is very limited. In oil painting, you can blend to make almost any color you want. For works of mosaic glass, you select your colors from a finite set of colors. You might be able to search for other tile distributors for a broader selection (as I did for the golden and silver tiles), but you still are limited compared to paint. What’s interesting is the pallet of the original San Damiano Cross is limited in itself. I don’t know why, but the colors are largely red and more red. As an artist, I felt inclined to expand beyond that. I also felt inspired (and I don’t claim to understand the source of all this inspiration — but I hope the Holy Spirit) to go a more Latin American direction. I have admired Latin American tile folk art for years, with the bright colors like teals, reds, and rich blues. This was starting to morph from piece honoring the original San Damiano Cross and possibly St. Francis, to Pope Francis and his South American ministry. Sometimes these things take a life of their own! This is part 1 of a 3 part blog post. 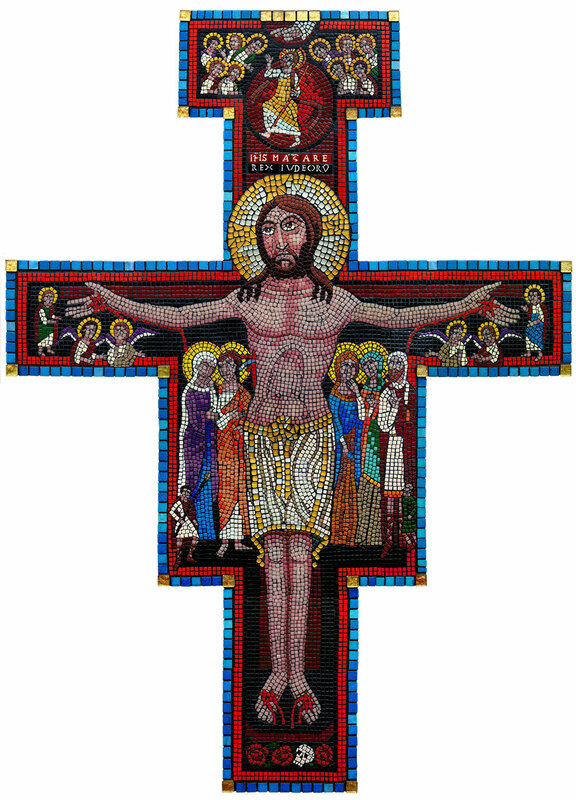 This post covers the inspiration of my San Damiano Crucifix mosaic. The next will cover the construction of the piece. The third installment will go through the process of finding a good home for this object that has played such an important part of my life for over a year. Select Format & Size Poster - 17"x24" Mug - 11ozCanvas - 12"x16"Canvas - 16"x24"Canvas - 24"x36"
Select Format & Size Poster - 18"x24" Mug - 11ozT-Shirt - MediumT-Shirt - LargeT-Shirt - X-LargeCanvas - 10"x14"Canvas - 16"x20"Canvas - 20"x24"Canvas - 24"x30"
Select Format & Size Poster - 17"x26"Canvas - 10"x14"Canvas - 16"x24"Canvas - 20"x30"